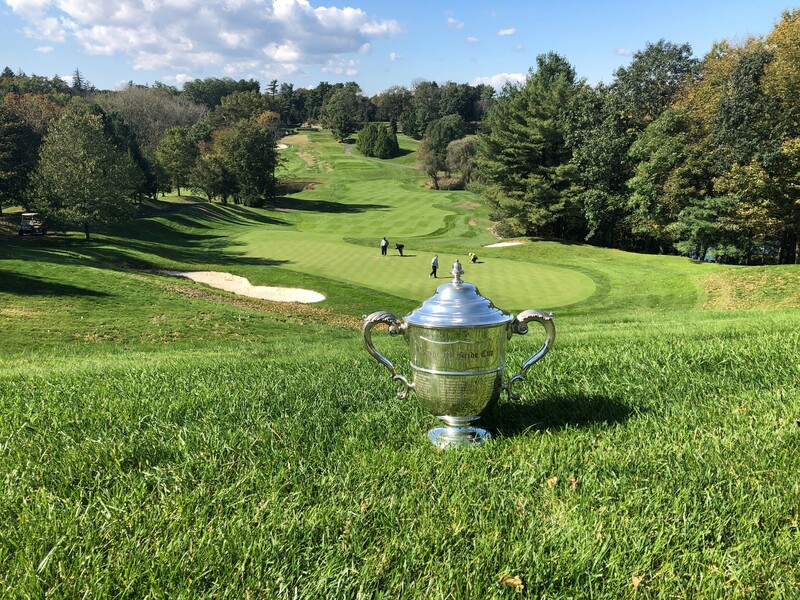 BEDFORD HILLS, N.Y. (October 17, 2018) – Thirty-six father and son teams competed this year at the 68th MGA Father and Son Championship at GlenArbor Golf Club, but Stephen Nicholas and James Nicholas hoisted the trophy for the third consecutive year thanks to a round of 3-under 69. The Nicholases played the outward nine at a steady 1-under 36, thanks to birdies on Hole Nos. 4 and 8. A hiccup came in the form of a bogey on the par-5 12th hole, however they were able to bounce back strong by rattling off three consecutive birdies en route to an inward nine of 2-under 33. Their performance on the day left them three shots clear of the closest competitors and as the only team to finish in red figures. The victory makes the pair the third father-son duo to win the title three-consecutive years (matching Mark and Mark Jr. Stewart and Joseph and Terry McBride), and the first pair to win the title four times overall. Pat Mucci and Joseph McBride both claimed the title four times, winning titles with multiple sons. A match of cards determined second place among the teams that shot even-par 72. Charles Marvin and Jeff Marvin of Greenwich won the match of cards thanks to a back nine score of 2-under 33. In the pro division, Mike Summa and Joe Summa of Stanwich took home the victory thanks to a steady round of 1-over par 73. A low net winner was also awarded, with James Cirocco and Jay Cirocco of Hudson Hills leading the way with a 5-under 67. GlenArbor played to a par-72 at 6,184 yards.